Deciding on the right place to set up your startup space can be quite challenging. It is a big decision to make, because if you are not planning for your garage or basement to be your launch pad, then the cost of setting up an office will be one of the major overheads you will have to deal with. The current market rent rate for Whitefield is INR.50/- to 60/- per square feet/per month. Generally, you require around 200 square feet office space per person. That fixes the rent at Rs.10,000/- to Rs.12,000/-. Compared to the above, the going rate for renting serviced offices in Whitefield per person/per month is Rs.8,000. 2. Flexibility. No lock-in periods. Renting private office spaces usually involves long lock-in periods of 5 to 10 years. This arrangement, seen from any angle, doesn’t suit startups. As a startup, be cautious about signing up for a long lock-in period. Somewhere down the line, you may outgrow your existing office space or you may want to downsize.If you’re not sure, it is best to avoid this restrictive long-term lock-in period clause. The nature of your business, number of employees, storage space required, future growth plans, etc. will decide the size and location of the office you should go for. Then there is also the matter of access to meeting rooms, board rooms, cafeteria, restrooms and other facilities to be considered. Choose a space that will allow you to start off small, perhaps even with a meager 50 square feet if need be. Then you can gradually occupy more space as you grow. It also allows you to scale and remodel your startup space in line with what your brand and business operations growth demand. Aside from price, the location is the single most important thing that will decide the success of your startup. Let us deal with this in two parts. First, we will tackle the broader choice of city, and then narrow it down to the area within the city. Startup Talent: With its high number of Engineering / Science and other Technical colleges, there is no dearth for technical talents. With its tag of “Silicon Valley of India,” Bangalore attracts talent from all over the world. Startup Funding: The sheer number of startups in Bangalore is matched only by the crowd of established venture capital funds and angel investors operating out of Bangalore, and focusing their investments on startups located in the city. Networking: Bangalore has a well connected and robust startup community and venues that organize startup events all the time. A startup founder can meet and network at least 2-3 days per week in order to grow the business faster than competitors in other cities. Whitefield: Whitefield is where you will find most of Bangalore’s Fortune 500 companies and large MNCs. Companies and tech startups in sectors ranging from IT and mobile applications to software, education technology, healthcare, etc, prefer to operate in and around Whitefield. 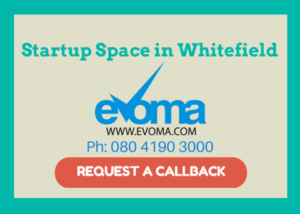 This means that when it comes to choosing where in Bangalore you should locate your startup, Whitefield is the winner by a mile.